^ a b c Van Valkenburg, Kevin (20 May 2015). "The Untouchable Felix Hernandez". ESPN Magazine. Retrieved 20 May 2015. ^ Lewis, Adam (May 14, 2014). "After being pulled, Felix ejected for first time in career". mlb.com. Retrieved 4 April 2016. ^ Johns, Greg (June 8, 2014). "Felix fans 15 Rays to establish new career high". mlb.com. Retrieved 10 April 2016. ^ "Hernandez gets 2,000th strikeout, win against A's". ESPN. Associated Press. 11 May 2015. Retrieved 11 May 2015. 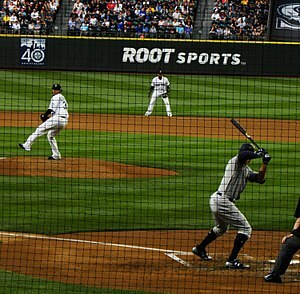 ^ "Felix Hernandez Ties Randy Johnson's Strikeout Mark". TheSportsQuotient.com. 2016-04-17. Retrieved 2016-04-25. 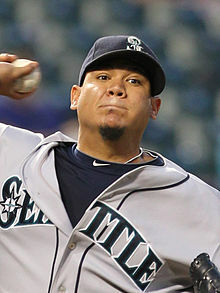 ^ "Felix Hernandez is the new strikeout King in Seattle". Sports.Yahoo.com. 2016-04-24. Retrieved 2016-04-25. ^ Simon, Andrew (February 19, 2019). "Most consecutive Opening Day starts by pitcher". MLB.com. Major League Baseball. Retrieved 9 March 2019. ^ "Mariners RHP Felix Hernandez becomes U.S. citizen". Associated Press. ESPN. 25 September 2018. Retrieved 25 September 2018.